Kale & apple butternut salad is a perfect healthy fall dinner or Thanksgiving side. 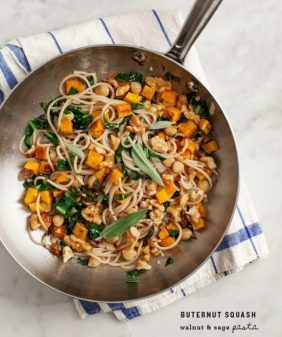 Butternut ribbons add fun color and texture to this delicious dish. We’re on a butternut squash kick this week. It wasn’t intentional, it’s just that one butternut squash times two people equals about four meals. It’s a squash that keeps on giving. Today’s special shape: ribbons! No special gadgets required – just get out your regular veggie peeler, and peel away. Toss with a tangy dressing (it’ll help tame down the raw bite), and toss with kale, apples, herbs and nuts. If this is all too green and healthy for your traditional Thanksgiving meal, just think of it as your pre-turkey-day (delicious) detox! 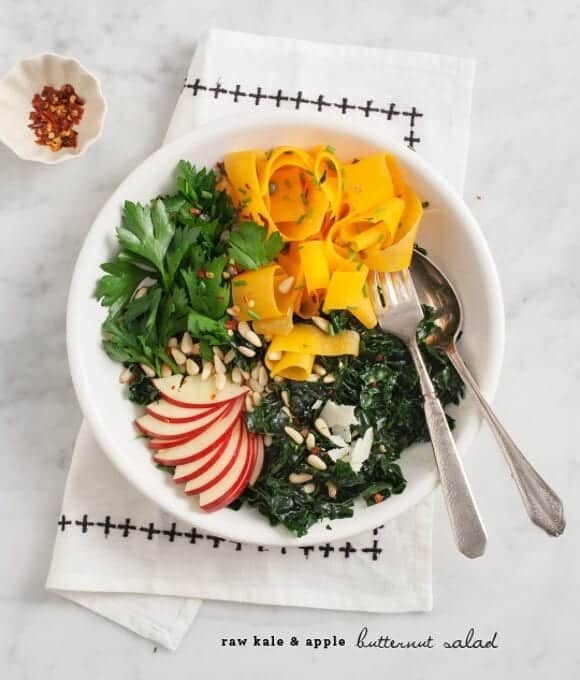 This kale salad is full of fall flavors from apple and butternut squash. 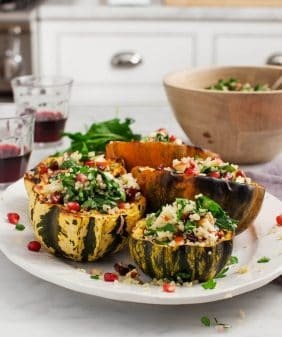 A delicious Thanksgiving side or healthy autumn dinner! Make the dressing: whisk together the lemon juice, sherry vinegar, Dijon, garlic, olive oil, chives, salt, and pepper. Taste, adjust seasonings, and set aside. Place chopped kale leaves in a large bowl, drizzle with a tiny bit of olive oil and a few pinches of salt. Using your hands, rub the leaves together massaging the kale until it becomes soft and darker in color. Toss with half of the dressing. Set aside. Slice your butternut squash lengthwise in half, scoop out the seeds, and slice lengthwise again and again so you have long wedges. Using a regular vegetable peeler, peel off long strips. 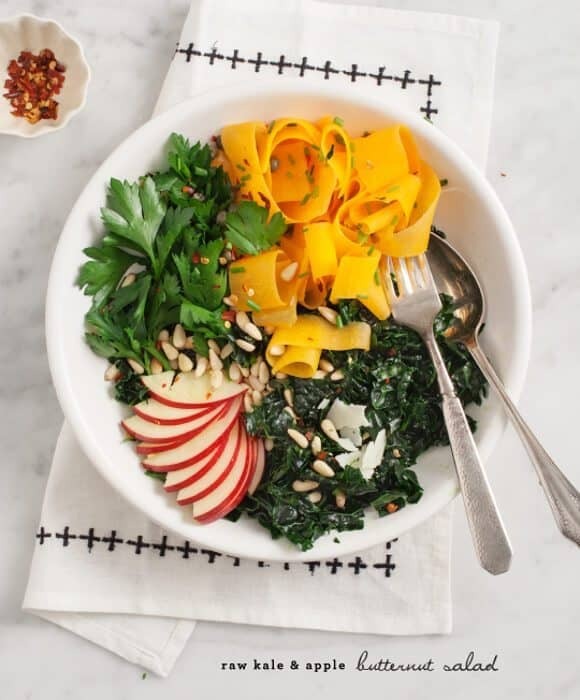 Assemble the salad: toss the kale, butternut ribbons, apple slices, parsley, pine nuts, and chives with the remainder of the dressing. Let it sit at room temperature for 10-15 minutes (for best flavor) and serve with shaved pecorino and a pinch of red chile flakes, if you like. Raw kale tip: I wash mine in warm water to help it begin to soften. This looks so pretty! And it sounds delicious. A perfect pre-Thanksgiving meal. I want a plate right now. Mmm love this recipe. It’s so full of goodness and the shaved butternut squash is gorgeous! 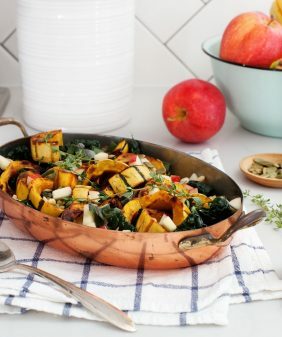 Definitely can’t go wrong with butternut squash and apples! I just bought and enormous squash (part of which will be used for the spiralizer experiment we discussed earlier this week!) but I’ll keep some leftovers to make this too! ha! I love it when the hubby’s are convinced, let me know if he (and you) like it!! Your pictures are always so delicious. It makes me eat with eyes first. omg, you think too highly of my pasta-making skills :). I don’t know if anyone’s noticed, but I’ve been trying to simplify things lately… fewer ingredients & the less processes the better! I cannot wait to make that pasta from the other day! Such a pretty salad! 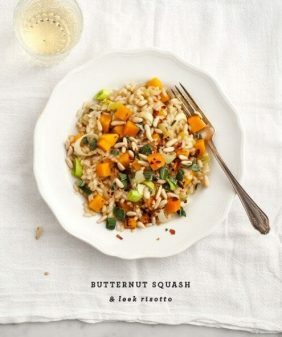 I’ve never eaten butternut squash raw before–must try very soon. 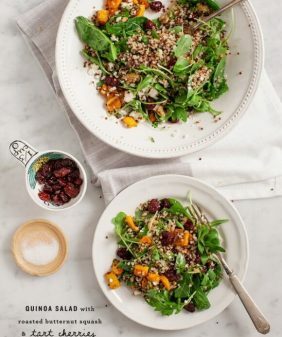 You just took my favorite fall/winter produce and put it into one amazing looking salad. Beautiful, and delicious to be sure! Oh wow, this is a gorgeous salad. 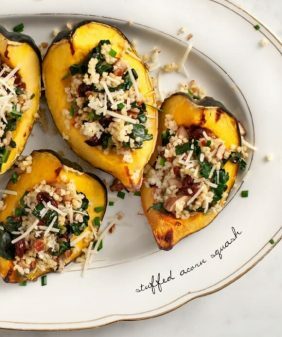 I love the flavor combo, and it is the perfect use of fall ingredients while keeping it light and fresh. Thank you for the inspiration, will definitely try! this is so lovely! i’ve never thought of eating raw butternut squash. 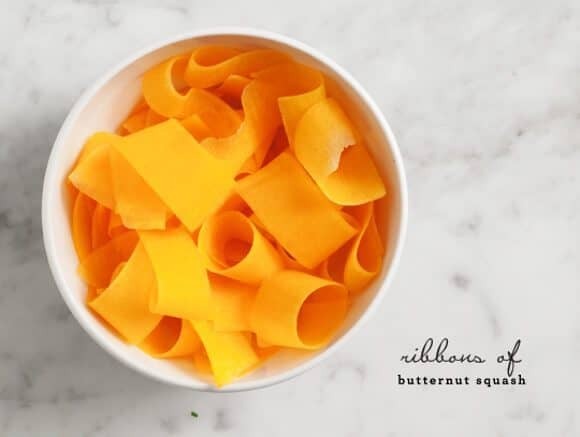 I love the use of butternut ribbons. Makes this simple salad so so so much prettier and even more delectable! This is absolutely beautiful and delicious- all in one lovely Thanksgiving package. Your images inspire me with my own designs and paintings and I can’t stop looking at them :). What a gorgeous elegant meal!